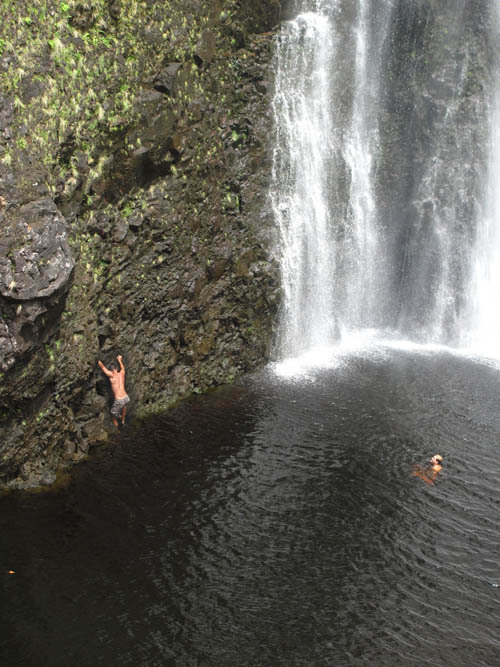 On the second day of our adventure at Waimanu, we hiked to the foot of Wai`ilikahi Falls, to experience the allure of the valley and swim in the pool at the base of the falls. When we awoke in the morning, the first rays of the sun illuminated the sea cliffs overlooking the Kohala-Hamakua Coast. 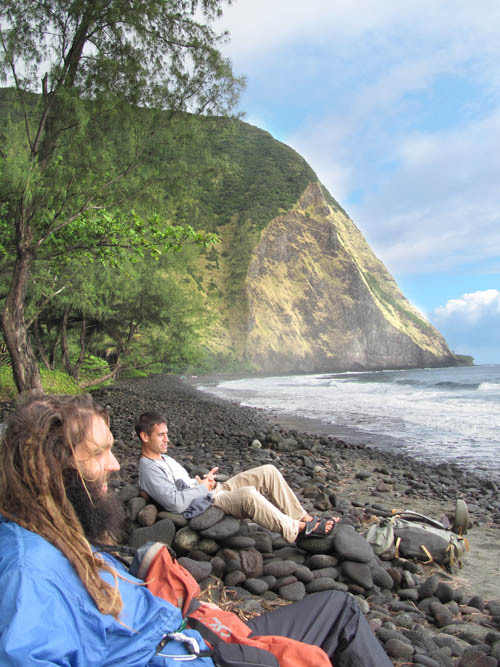 We relaxed on the shore where some enterprising campers had constructed reclining “lazy boy” seats from rocks and boulders on the black sand beach. When we looked towards the back of the valley we were surprised to see additional waterfalls we had not seen the day before. While it only rained lightly and intermittently on our campsite on the coast at night, it apparently rained much harder in the surrounding mountains creating additional waterfalls. 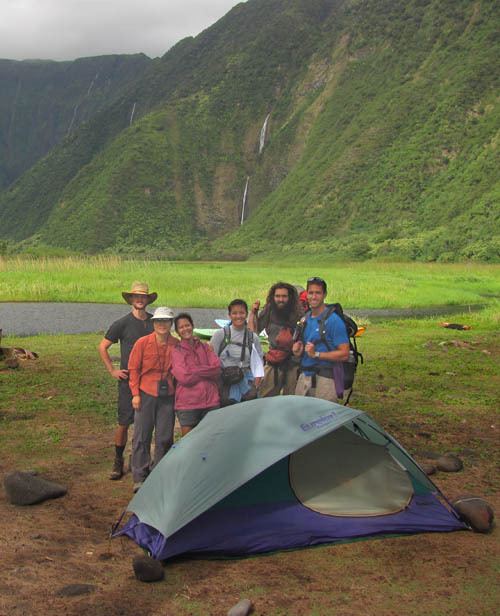 After having breakfast and preparing ourselves for the day, we spoke to the campers in the neighboring campsite as we pushed-off for the base of Wai`ilikahi Falls about halfway back the valley. One of the amusing things we learned from the neighboring campsite is that they gave our group a nickname — “Mix Plate” — for the great diversity in our group — women and men, American, European, Asian, and Rastafarian — which is really just a reflection of the diversity in the Hawaiian Trail & Mountain Club. We also learned from the neighboring campsite that the gunshots we heard the night before were from their hunting adventures. They shot a pig after dusk, but were unable to retrieve the animal when it fled into the shadows. 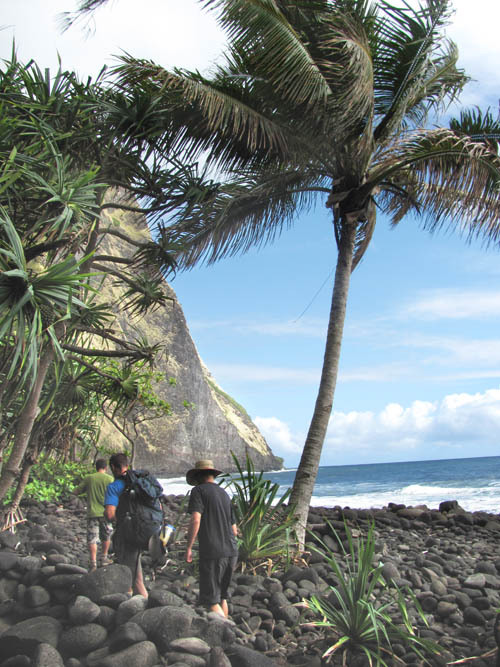 After wishing our neighbors a good day, we pushed-off for the far end of the beach where we turned mauka just before the tall sea cliffs and headed towards the back of the valley. When we neared a pair of giant mango trees, we stumbled on a dead pig right next to the trail! After seeing a gun shot wound we knew it was the pig shot by our neighbors the night before. Large kukui trees and lauae ferns dominated much of the far side valley where literally thousands of kukui nuts litter the forest floor. 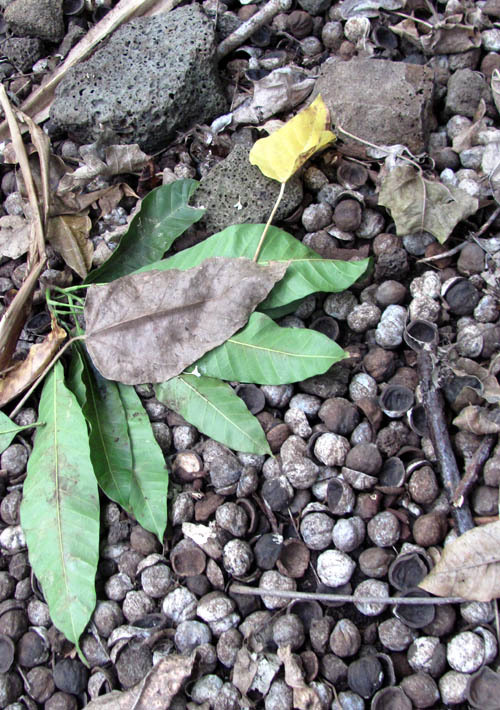 Walking on round kukui nuts is like walking on marbles — they made the footing unsure and we slipped and slided over the trail as we made our way to the back of the valley. From time to time, the forest canopy would partially open up giving me a chance to zoom in on the last plunge pool high above from which Wai`ilikahi Falls makes its final fall to the valley floor. When we finally reached the pool at the base of the final 300 foot drop of Waiilikahi falls, we were awed at the impressive sight! From our vantage point at the base, we could only see the the final plunge although the combined fall is well over 1,000 feet. The sheer volume of the falling water generated its own wind which swept over the surrounding area at the base of the falls. August and I climbed a small ridge along side the pool in order to get a better vantage point to view the base of the falls. The slope was covered with charming sword ferns and awapuhi — the shampoo ginger introduced by the Polynesians. 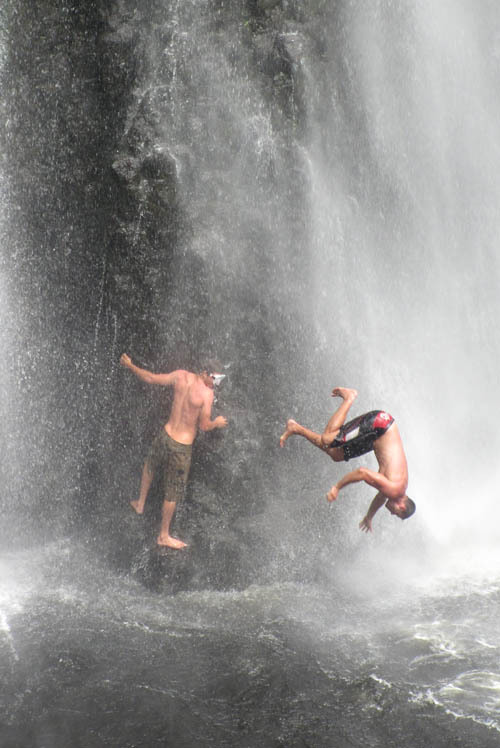 Several other campers were at the falls at the same time — some of whom climbed up the waterfall to jump into the water. Others were snorkeling in the pool to catch prawns. 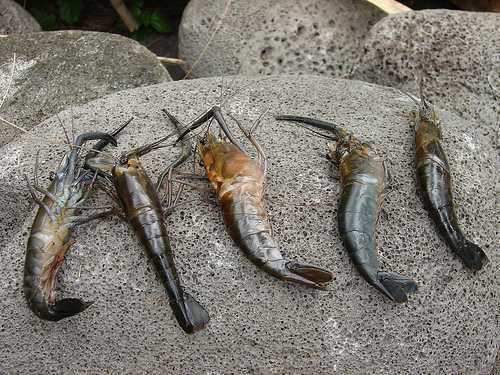 Using a net to scoop up the prawns at the bottom of the pool, the other campers caught about two dozen Tahitian prawns (Macrobrachium lar) — a non-native species with long thin pincers that were introduced in 1956. 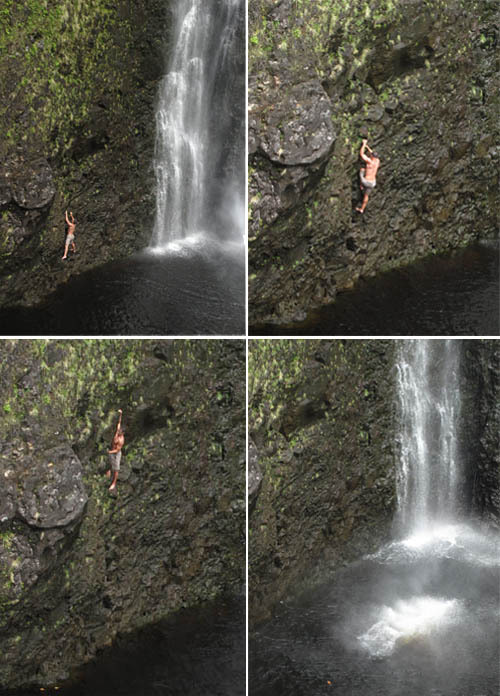 After diving in the pool and swimming to the base of the waterfall, Pete pulled himself out of the pool to scale the rock wall demonstrating his climbing prowess. Exploiting a barely noticeable crack for handholds and footholds, Pete climbed almost 30 feet up the vertical rock wall and then dived into the pool several times. After swimming, diving and relaxing by the pool for quite some time, dark clouds began to gather — a cue we took as time to leave and return back to camp. While hiking back to our campsite. I could not resist taking one last shot of the falls through the dark forest canopy as we made our way back out. But before returning to camp, our one chore for the day was to visit a small stream fed by Keawewai Springs, on the west side of the valley where we filtered drinking water for the day. 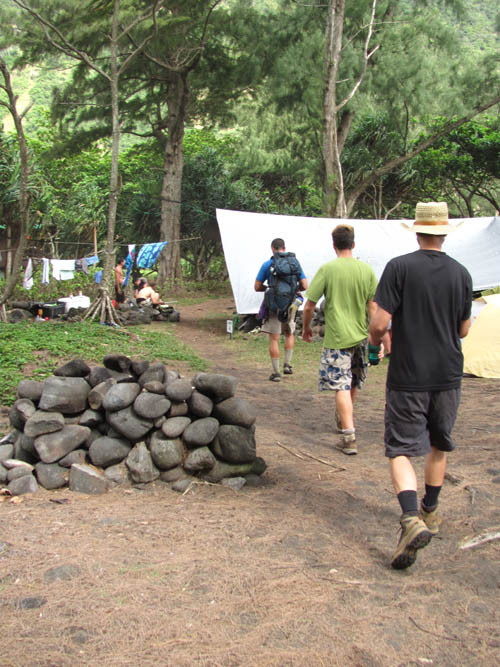 Several of us veered-off the trail to forage for mountain apples (ohia ai) before making our way back to camp. While I bathed in the stream and then snoozed under the trees, the gang borrowed a two-man kayak from the neighboring campsite. 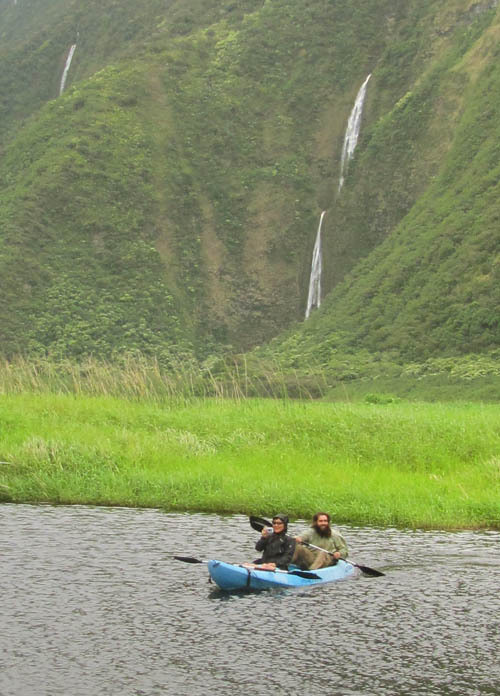 In the photo above, Miyo and August paddle upstream to explore the waterway as it meanders through the grassy wetland. Our campsite whirled with activity as the day drew to an end and we made dinner for the evening. 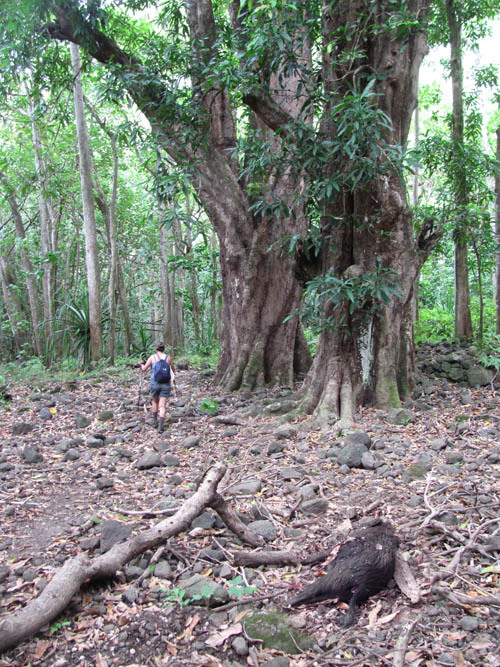 Those of us who gathered mountain apples (ohia ai) during the day — such as Eva above — munched on juicy fresh fruits, while the rest of us had to make due with dehydrated prunes. 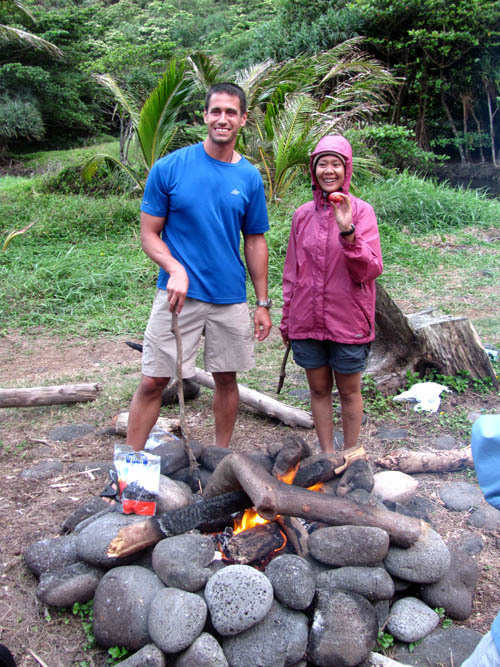 As darkness began to descend, we prepared for our last night at Waimanu and started a roaring campfire where we told amusing stories about each other — the more unbecoming and embarrassing the better. Stay tuned for the last installment of our backpacking trip where we make our way back out from Waimanu to Waipio and make our way back home. The first installment is here and the third post is here. 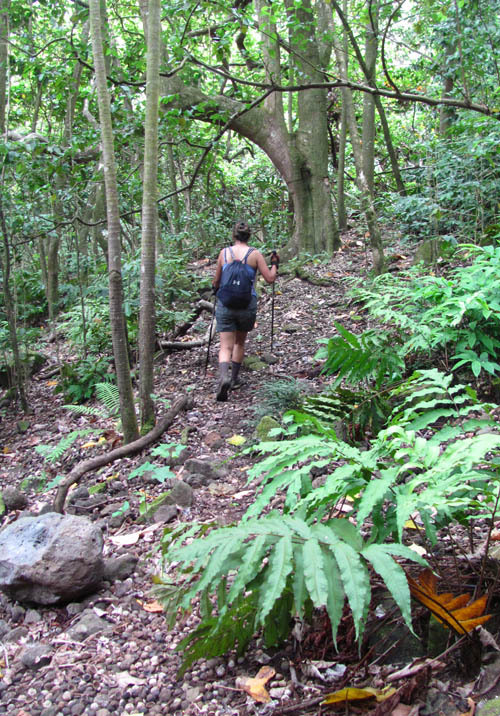 My husband and I are planning on hiking Muliwai Trail on our honeymoon, but most hiking I see is done in groups. Any thoughts on whether it’s safe to hike as a pair? Or would you suggest group hiking? Thanks and loved your recap! Beautiful! Damn sure looks like everybody had a good time. I can see why. Beautiful. 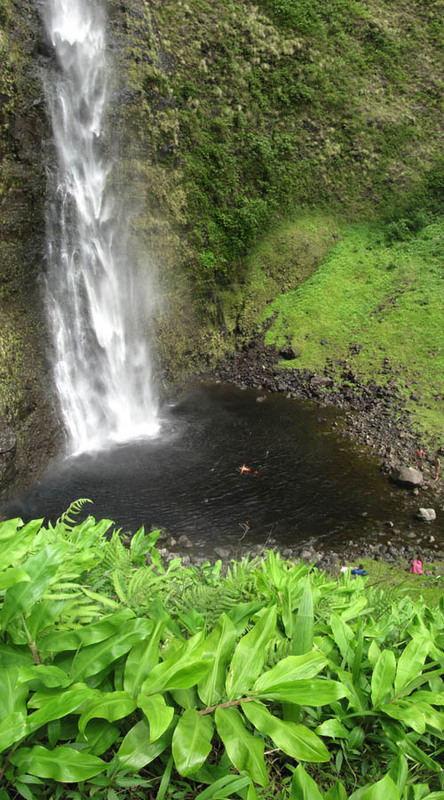 I stumbled across this site while looking for information about hiking to Waihilau Falls, which is supposed to be one of the tallest in the world and accessible from Waimanu Valley. Did you see it or know anything about hiking there? 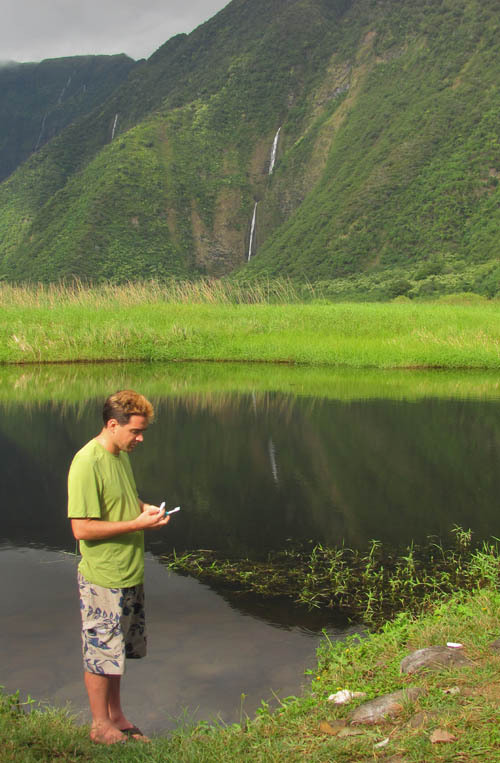 I didn’t see any pictures here, or on a couple of other sites devoted to the Waimanu Valley. Whatup? 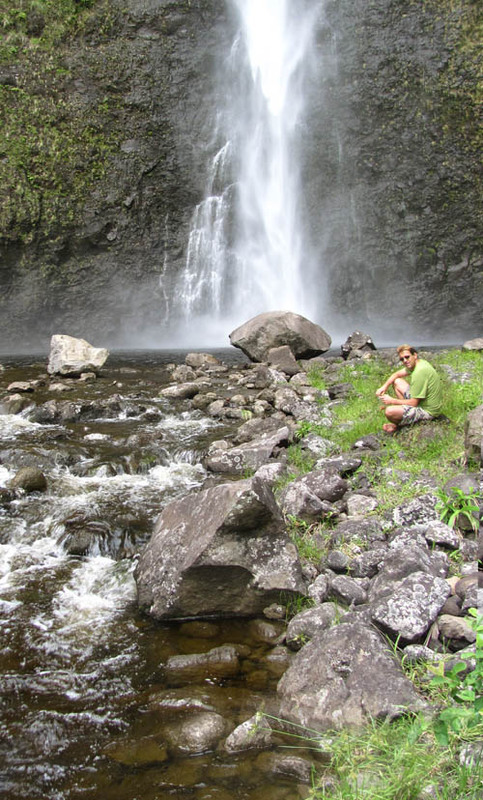 Hey Brian, my husband and I hiked it november 2013, Waihilau Falls is tough to get to, you can’t even see it from the camp. 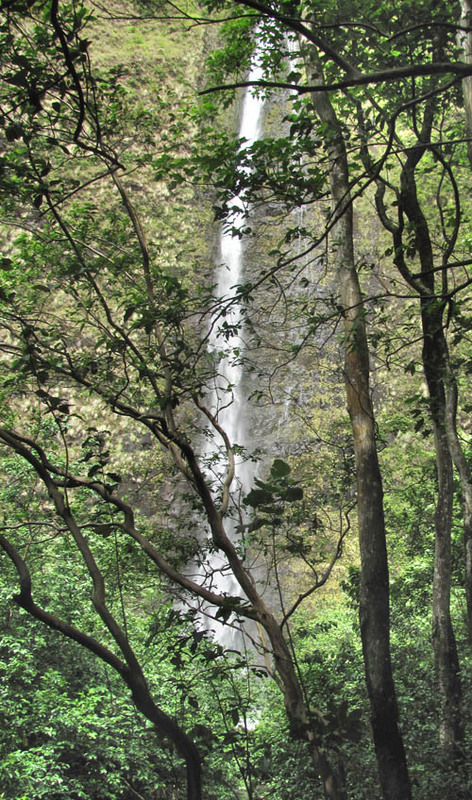 You’ll have to camp at least 2 nights if you plan on making the hike to Waihilau Falls. There are definitely easier waterfalls to hike to in the Valley. But next time we hike it we will definitely make time for Waihilau, once you’ve gone the distance and come so close it’s hard to turn away and go back home having not swam at it’s base. But just getting to Waimanu is life-changing.